Mix 102.3 13.0% The ARN station has led from start to finish in 2015. Its final winning 10+ share though is the lowest of the year. The year high was in survey six with 15.2%. Breakfast with Jodie and Soda was knocked off narrowly by Fiveaa. The final breakfast share of 12.7% this year was down on the year’s best of 15.3% in survey six. 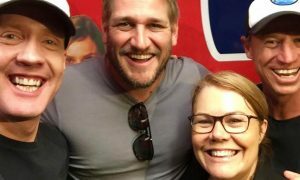 Share was down over two points this survey in morning, afternoon and drive with Hughesy and Kate giving up the drive top spot to Nova. One of the biggest share movements we have ever seen was Mix 55-64 dipping 8.8 points to 13.1%. 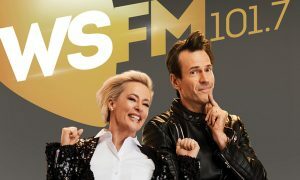 Nova 91.9 11.2% Breakfast with Lewis and Lowe was back in double figures for their final survey with executive producer Tim Verrall who has gone to the new breakfast show at Nova 100 in Melbourne. The final 2015 breakfast share of 10.6% was behind their best though of 12.1% in survey three. The station’s best 10+ share was 12.5% in survey four. 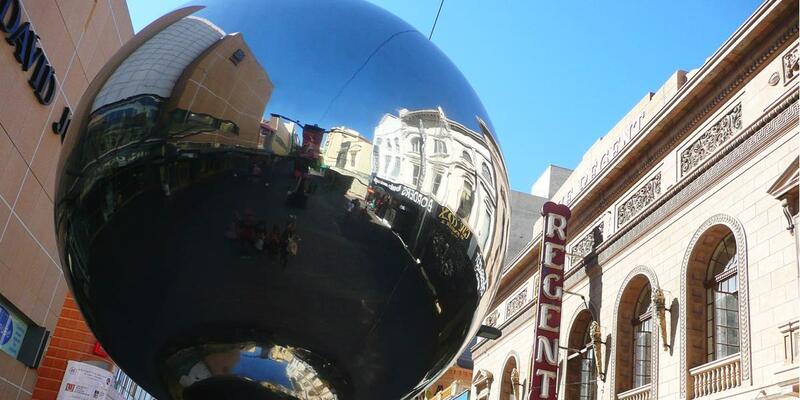 Kate, Tim and Marty are the new Adelaide drive leaders with share up 1.0 to 13.3%. Nova is back in top spot 25-39 with 18.5% (+3.1), overtaking hit107. Fiveaa 10.2% The new look breakfast show with David Penberthy and Will Goodings has become #1 commercial in the market, edging ahead of Mix by just 0.1 of a point. 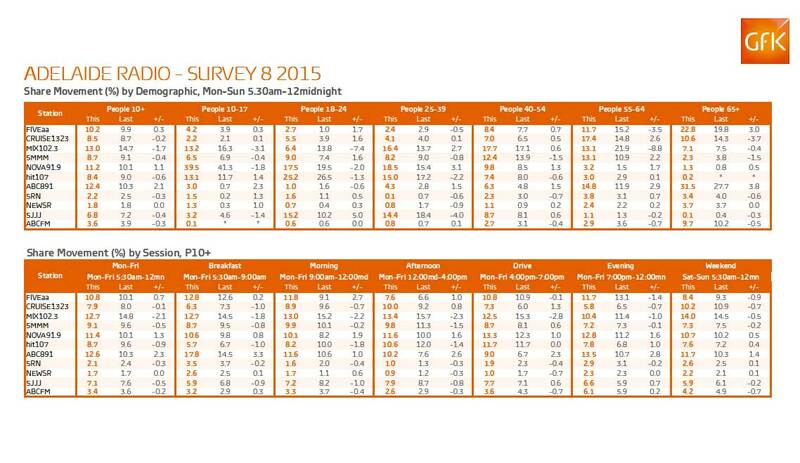 Fiveaa breakfast has had the edge over Mix in five of the eight surveys this year. The survey eight breakfast share of 12.8% trails the year best of 14.1% in survey three. The year’s best 10+ share was 12.0% in surveys three and four with the only dip under 10% the 9.9% in survey seven. Mixed demo messages this survey, with 55-64 down 3.5 to 11.7% and 65+ up 3.0 to 22.8%. 5MMM 8.7% Share was down 0.4 this survey with a year high 10+ of 9.7% in survey one. Breakfast with Roo and Ditts was down 0.8 to 8.7% with a year high of 10.3% in survey one and they hit double figures again in survey five. Cruise 1323 8.5% The station hit double figures just once this year with 10.4% in survey four. Breakfast ended the year down 1.0 to 6.3% after posting its best result in survey four with 8.2%. hit107 8.4% Share backed off a little (-0.6) to end the year after peaking at 9.3% in survey six. Breakfast with Amos and Cat was down a point this survey to 5.7% after a 7.3% two surveys ago.